When I go anywhere for only a couple of days, I try not to shift my body clock. It prevents jet lag, mostly. This weekend I'm at my folks' house outside San Francisco, which has a two-hour time difference from Chicago. That is why I woke up at 5am and walked to the local Peet's Coffee, as I usually do. This trip I may allow my clock to drift westward, though. I'm going to Tuesday night's Cubs game at AT&T Park at 7:05pm—9:05pm Central time—and would like to see the whole game. The Cubs might even win. I mean, they have a 1-in-3 shot, right? I do like getting to the Peet's this early, though. First, the just-before-dawn walk is quiet and even a little spooky down the local bike trail, but today I got a tremendous view of the crescent Moon and Venus, which are passing just 2° from each other this morning. I'm never up this early at home unless I'm still up, which hasn't happened in years anyway. Second, the Peet's is quiet right now. In two hours it'll be packed with families and locals (the fishermen who stay here for hours at a time most mornings are more colorful than any of the characters at the Alibi Room). Time to write for a bit, and wait for the rest of my family to wake up. 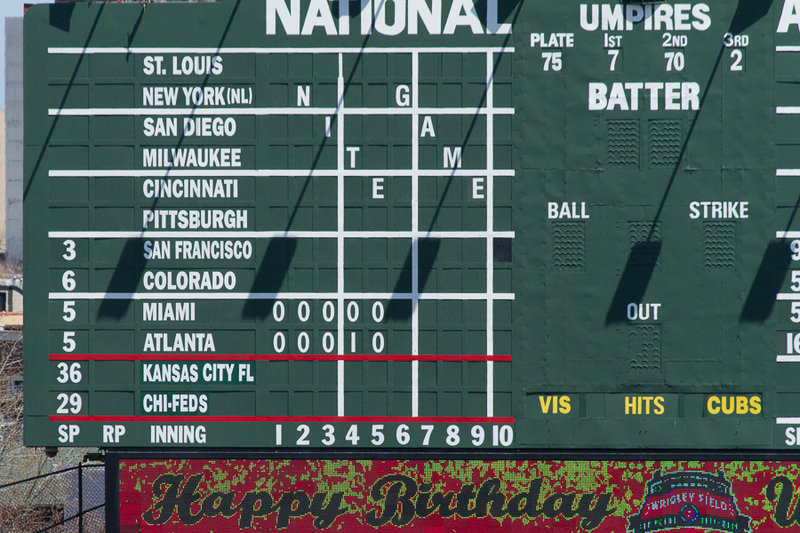 The Cubs announced early Thursday that they plan to ask the city to approve more signs in the outfield at Wrigley Field, a move that comes after "endless hours" of negotiating with rooftop owners have gone nowhere, Cubs Chairman Tom Ricketts said in a video. In the six-minute video to fans, Ricketts blamed rooftop owners for delaying the renovation of the field, saying "Despite the city's approval and our clear contractual rights, they plan to file lawsuits to stop our renovation and expansion plans." Well, sort of. The Cubs agreed to a 20-year contract with the rooftop owners in 2004, so the rooftop owners actually have a case. Of course, a Jumbotron in left field is exactly what the organization needs to win ballgames. I mean, there couldn't be any other reason, right? I went to yesterday's Cubs-Yankees game at Wrigley and was very happy in the middle of it that our seats are under the awning. Maybe rain is Tanaka's Kryptonite. As rain started to fall at Wrigley, the Cubs were able to total as many hits in the third inning as they did against Tanaka last month. Baker singled to lead off the third, moved up on Hammel's sacrifice, and scored on Bonifacio's single. Luis Valbuena doubled to lead off the fourth, and one out later, scored on Olt's single to make it 2-0. Valbuena went 0-for-3 in New York against Tanaka, and is the first player to get three hits off Tanaka in a single game. "I had more of an idea," Valbuena said. 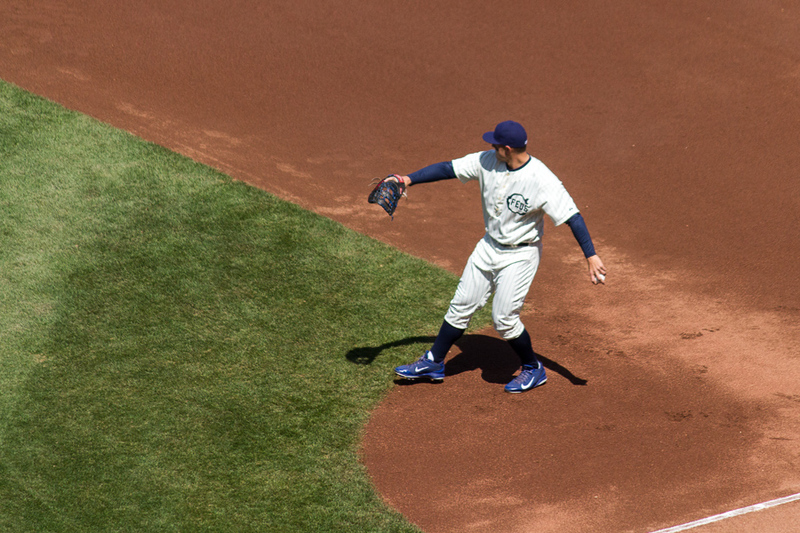 Outgoing Yankees captain Derek Jeter, who was presented with a No. 2 tile from the scoreboard in a pregame ceremony, had a pair of singles — the 3,354th and 3,355th of his career. He grounded out to shortstop Starlin Castro with the bases loaded to end the game. At that point, weather radar showed the rain ending soon, but not soon enough. Between the park and the #22 bus across the street I got drenched. I think my shoes are still damp. 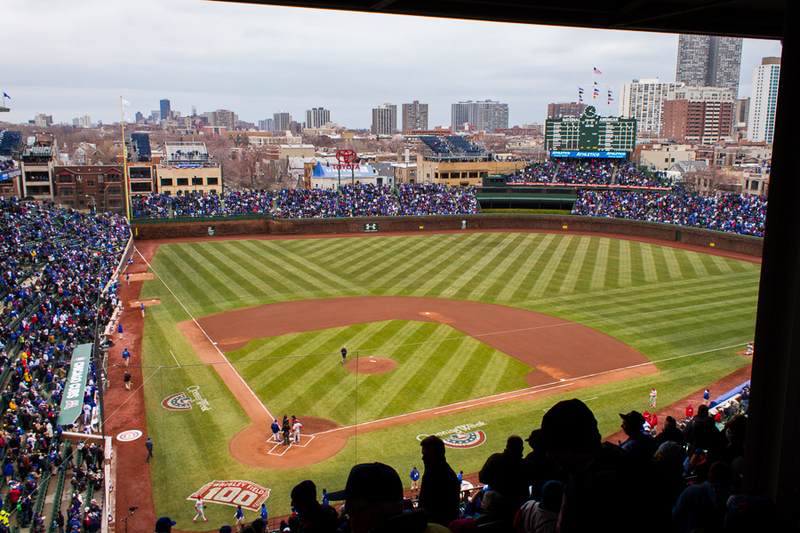 A piece about Wrigley Field's quirks. Two about how Oklahoma botched an execution yesterday, coinciding with the Economist (and I) wondering why America still has the death penalty. Chicago's city council will vote today on ride-sharing, with consequences to friends who Lyft and Uber. Via Bruce Schneier, an article about the Quantified Toilet hoax. Yes, there is such a thing. Who's a fan of whom? The New York Times has an interactive map of which ZIP codes support which baseball teams, according to Facebook. Some teams, apparently, just can't catch a break. I mean that literally. With the wind whipping off the lake, our shaded seats never got above 10°C, and felt a whole lot colder. We fled after the 5th inning. The Cubs lost, of course, 7-5. Some things really never change. The ballpark, which opened April 23, 1914, and celebrates its centennial Wednesday, is a quintessential Chicago building: practical, quietly graceful, a creature of function, not fashion. Despite those rationalist roots, it's a vessel for human emotion: hope, dreams, escapism, nostalgia, wonder — and, as Cubs fans know all too well, disappointment, disgust and bitterness. Only a smattering of those fans, I suspect, could name the original architects of Wrigley (Zachary Taylor Davis — who also designed Comiskey Park — and his brother Charles). Fewer still would be able to tell you that the ballpark actually reflects the hand of many architects, including the designers of the eclectic Wrigley Building and the art deco Chicago Board of Trade Building. What those architects wrought, working in a sequence that now covers 10 decades, is remarkable: a building shaped by many different hands that still hangs together beautifully. It helps us hang together, too, creating a shared, almost familylike experience that's all too rare in a world where people devise their own reality on smartphone screens. Yes, Wrigley needs help; some fans call it a dump. The ballpark is rich in lore but poor in amenities, and its bones have shown inevitable signs of age. Netting prevents chunks of concrete from falling on fans. Naturally, as an involuntary season-ticket holder, I'm going to the game, and possibly some of the pre-game festivities. And because it's a beautiful, sunny morning in April, I'm wearing long johns, heavy wool socks, a long-sleeve shirt, an undershirt, a warm hoodie, a winter coat, and fleece gloves. How else would someone dress for a game at Wrigley before Memorial Day? Game-time forecast: sunny, breezy, 6°C. Brrr. You can't quite see the 40 km/h winds blowing in from left field, nor can you see how I was in long johns, four layers, a winter coat, hat, hoodie, scarf, and gloves, because it was 3 frickin' degrees C.
Today and tomorrow should have better weather, and we should actually have spring weather by Thursday. And the Cubs, having now won only 25% of the games they've played this season, might win a game. Don't get me wrong; I'm not blaming the victim, who in this case would be the City of Chicago. 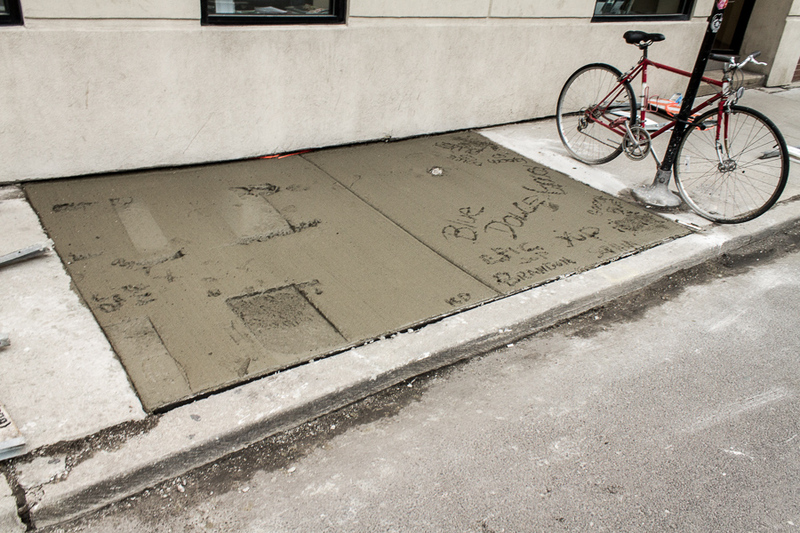 But, come on, that concrete was practically asking for it. Maybe it shouldn't have gone out alone in Wrigleyville on opening day. Today: A 20 percent chance of showers. Cloudy, with a high near 7°C*. Windy, with a south wind 24 to 32 km/h becoming west southwest 40 to 48 km/h in the afternoon. Winds could gust as high as 72 km/h. So, high winds blowing straight out? Probably won't exactly be a pitchers' duel then. Photos and details coming after the game. * Did you know you can hover over these dashed lines to see the Imperial conversions? I've been doing this for years, but not everyone seems to know about the feature. Enjoy. And sometimes, it rains. That's the forecast for tomorrow's opening day at Wrigley Field. So far the Cubs haven't won, though. They're 0-2 for the season, starting their third game at Pittsburgh in just a few minutes.